During the late 1930s, combat realities were overcoming the 'political correctness' of the time which maintained that the Soviet armor was at least as good as those of potential adversaries. It was after the battles against Japanese forces on the Mongolian border that revealed the shortcomings of the Soviet tanks in service. While updated designs commenced, political battles ensued between the designers of the T-34 and the KV-1 who were competing for production. It was Operation Barbarossa in June, 1941 that ended the debates. Germany had invaded Russia and everything available was sent to the front and production lines of near-obsolete weapons continued until they could be replaced by newer designs. Initial T-34 production had started before Germany's invasion, but production was halted as many factories were evacuated east of the Ural mountains to provide a buffer against the German advance. As more relocated factories came back online, T-34 production was spread across eight factories to provide the necessary firepower to blunt and repel the Germans. The early T-34s were armed with a 76mm gun which was adequate against the Panzer III and Panzer IV series, but as the Panther and Tiger came online, Soviet designers realized they needed a bigger gun. The T-34 was redesigned with a larger turret that housed an 85mm main gun as well as the radio equipment that had previously been located in the hull. This new T-34 (T-34/85) also had thicker armor and other critical improvements. The result was a medium tank that could counter the German Panzer V (Panther) medium tank as well as the Panzer VI (Tiger) heavy tank. The T-34/85 not only pushed the Germans back to Berlin, it would serve in a variety of armies around the globe, some of which can still be found in operation today. When I first heard about this Italeri 1/35 T-34/85 kit, I initially dismissed it as another reissue, but was I wrong! When this kit arrived, it was not at all what I expected. 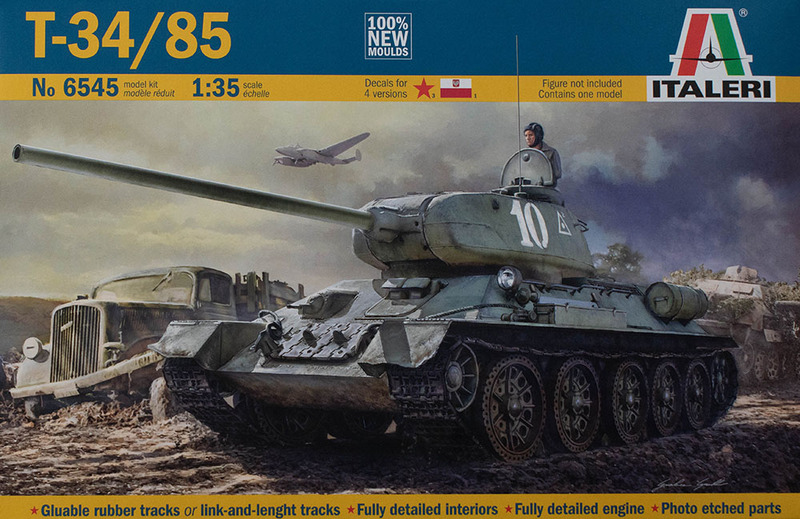 Looking back into the databases, Italeri did release a T-34/85 in 1/35 as kit 0295 back in the mid-1990s, but it was actually a rebox if the Zvezda kit. Of all of the armor kits in Italeri's catalog, they'd never tooled the T-34 in 1/35 scale - until now. To make matters more interesting, this is also one of their first tank kits produced with an interior! Did aliens abduct the old Italeri? If so, I like this new one! 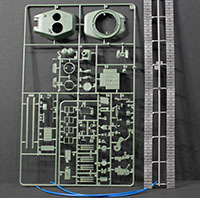 The kit is molded in green styrene and presented on five parts trees (duplicate tree not shown) plus one tree molded in light gray, and one fret of photo-etched details. As with other Italeri kits, this kit is not overly complex or filled with lots of really tiny parts. We've seen some impressive armor kits with interiors, but once you get the kit on the bench, you realize that there are nearly as many kit parts as there were full-scale parts in the tank in question. This kit strikes a happy balance between detail and buildability which we'll discuss further shortly. You might think that all T-34/85s are built the same, and from a moderate distance, they do appear nearly identical. But to T-34 experts and enthusiasts, there are numerous little details that distinguish these tanks from the various factories. As noted in the kit title, this model represents a Factory (Zavod) 183 example from 1944 production and Italeri captures these details nicely. For example, the turret has a noticeable 'step' joint that moves from the gun centerline to the widest points on the turret. Italeri made this production seam of the full-scale turret the same for the kit turret halves and includes weld marks along the seams. Everything from the radio antenna mount on the turret, split hatch for the commander's cupola, to the distinctive S-53 gun and mantlet are here. So how does this interior kit compare to other offerings on the market? I've seen the T-34 with interior from companies like AFV Club as well as the intricate T-44 interior kits from MiniArt (for some reason, they haven't tackled the T-34 yet). The MiniArt kits, for example, have great detail but they are also full of those tiny parts which provide that impressive detail which isn't really visible once the tank is assembled. Ditto on the AFV Club (and similar) kits. One of the pet peeves from noted armor expert Stephen 'Cookie' Sewell is the lack of transmission provided in some of these kits. The transmission is present in this kit. The engine is somewhat simplified as it isn't as visible from either the overhead or rear access panels whereas the transmission has more detail given its visibility. Kudos for not over-engineering the details in areas where they won't be easily seen! 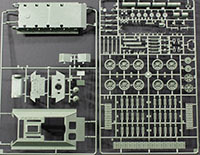 For the average modeler, this kit is going to look great when built out-of-the-box because you can pose the various hatches and panels open to reveal those details inside. For those who want to add figures, once again you have a model with seats and perches to seat or stand your figures and still have nice details surrounding them on the inside as well as outside. For the AMS modeler, there are so many T-34 aftermarket options out there that can add those elements you wish to enhance in this model. Italeri has done a great job on this kit and nicely captures the details of the great Soviet 'cat hunter'. I look forward to seeing what subject is next for this new level of engineering details. Thanks to MRC for the review sample.